The PCT-VC series provides full compatibility with all cable TV services. The VC-5U provides an alternative to the higher priced Electroline FT08300, while providing some additional capabilites that other products cannot provide. The VC-5U provides a full set of 4 amplified output ports. Each port carries the exact same signal level as the input port carries - in both the forward and reverse directions. This unique design makes the VC-5U a true lossless splitter in both directions, allowing you to connect virtually any cable TV device and enjoy worry-free operation. All 4 ports can be used for any type of device including a cable modem. The VC-5U also provides a Modem Bypass port. 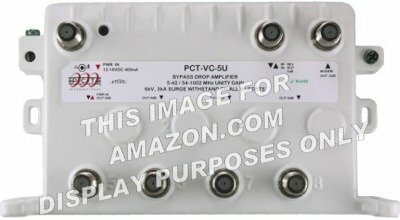 The bypass port allows you to connect any device to the amplifier (usually a cable modem or VoIP phone device) and insure operation of that device in the event of a power failure.The amplifier is surge protected (when properly grounded) and waterproof. It also has a unique mounting design that allows the amplifier to be mounted either horizontally or vertically with two separate sets of mounting brackets. This provides you with the best options for mounting the amplifier anywhere inside or outside your home. Supports operation from -40 degress to +140 degrees Fahrenheit. The amplifier can be powered from any location using an optional (not included) PCT power inserter. Power supply is included. Provides 4 amplified output ports with Active Return. If you have any questions about this product by PCT, contact us by completing and submitting the form below. If you are looking for a specif part number, please include it with your message.